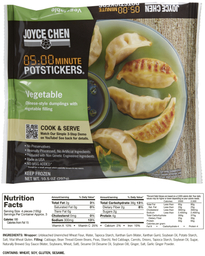 Based on original recipes by Joyce Chen, our three varieties of microwaveable potstickers are lower in sodium, fat and cholesterol than other brands. We recommend that you enjoy them as a delicious appetizer or meal. 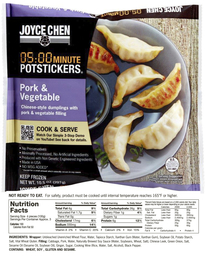 Joyce Chen 05:00 Minute Potstickers® are designed to be microwaved, unlike other brands that display microwaving cooking instructions on their packaging, in spite of not recommending this type of cooking. Our potstickers are premium quality, and contain no preservatives, MSG, or texture soy fillers. As a part of our commitment to minimal processing, we use unbleached, unenriched wheat flour to make our potsticker skins. Please note that our potstickers at not gluten free. In her restaurants, Joyce Chen coined the term Peking Ravioli for potstickers. We challenge you to take the 05:00 Minute Potsticker Challenge. Just follow the label’s cooking instructions or scan the QR code that links to a simple 3-step demo by Stephen Chen, president of Joyce Chen Foods. 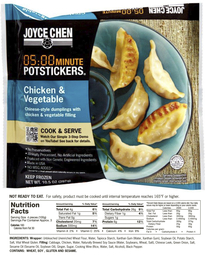 From microwave to skillet for browning to plate in 5 minutes, our great potstickers taste great. For a complementary dipping sauce, we recommend Joyce Chen Mild or Spicy Potsticker Dipping Sauce alone or partnered with Joyce Chen Sesame Oil and fresh scallions or cilantro. Our dipping sauces are unique in flavor, unique to the market, and low in sodium. In China, potstickers were prepared before the New Year celebration. Before the advent of refrigeration, these potstickers were stored in earthen jars, and kept outside. These jars are frozen during the winter. After New Year’s, the potstickers would be cooked in boiling water, without being thawed. On the New Year’s day, it was considered bad luck to cut or chop, because that would represent cutting your up coming good luck. That is why the potstickers would be prepared beforehand. Having a hair cut on New Year’s Day was also considered to be bad luck. Ingredients: Unbleached Unenriched Wheat Flour, Water, Tapioca Starch, Xanthan Gum (Water, Xanthan Gum), Soybean Oil, Potato Starch, Salt, Vital Wheat Gluten. Filling: Cabbage, Bean Thread (Green Beans, Peas, Starch), Red Cabbage, Carrots, Onions, Tapioca Starch, Soybean Oil, Sugar, Naturally Brewed Soy Sauce Mater, Soybeans, Wheat, Salt), Sesame Oil (Sesame Oil, Soybean Oil), Ginger, Salt, Garlic Ginger Powder.